Wy’East Nordic, Mt. Hood’s specialists in telemark and cross country skiing, provides year round instruction for all backcountry adventurers. Educational seminars, group workshops and individualized private lessons are available. Our professional teaching staff will guide you through new drills and skills to bring your skiing to a higher level. Classes are taught on Oregon’s spectacular Mt. Hood. Enjoy the breathtaking scenery and wonder of winter and summer. Join us this year for some great skiing and go beyond your expectations! WY'East Nordic operates under a special use permit from the USDA Forest Service Mt. Hood National Forest. 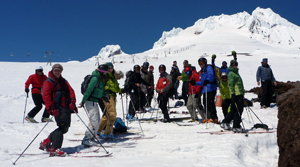 WY’East Nordic is a member school of the Professional Ski Instructors of America.